It’s summer vacation for many kids, but 51 students from 17 different regions have been spending their time off polishing and fine-tuning their geographic skills to prepare for this year’s National Geographic World Championship, a biennial geography competition hosted by the National Geographic Society. 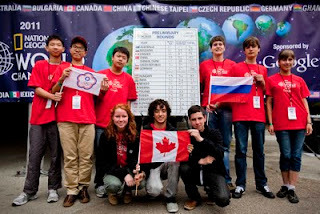 This year, Google is the proud sponsor and on Wednesday, July 27, we’ll host the three final teams from Canada, Chinese Taipei and Russia at our campus in Mountain View, California. The preliminary rounds included a written exam on Sunday and activities at the San Francisco Zoo on Monday morning. Teams ventured to various zoo exhibits and were asked to identify climate maps and geographic locations associated with 10 different animal habitats housed throughout the zoo. Since most of you can’t be here to witness the action in person, we’re going to live stream the finale, hosted by Alex Trebek of the game show JEOPARDY!. Tune into the National Geographic YouTube Channel Wednesday at 10:30 a.m. PDT to cheer on these young competitors from wherever you are in the world. Through this competition, we aim to inspire the future generation of leaders and innovators to become more geographically literate and have a deeper understanding about the world they live in. We hope you are as excited as we are to see such enthusiasm and passion around geographic education. Please join us in wishing all of these young geographic experts the best of luck!